hen the Deepwater Horizon well operated by BP (formerly British Petroleum) exploded and contaminated the Gulf of Mexico with at least 650 million liters of crude oil in 2010, blue-smocked animal rescuers quickly appeared on television screens. Looking like scrub nurses, the responders treated oil-coated birds with charcoal solutions, antibiotics, and dish soap. They also forced the birds to swallow Pepto-Bismol, which helps absorb hydrocarbons. The familiar, if not outlandish, images suggested that something was being cleaned up. But during the chaotic disaster, Silvia Gaus poked a large hole in that myth. The German biologist had worked in the tidal flats of the Wadden Sea, a region of the North Sea and the world’s largest unbroken system of intertidal sand and mud, and critical bird habitat. 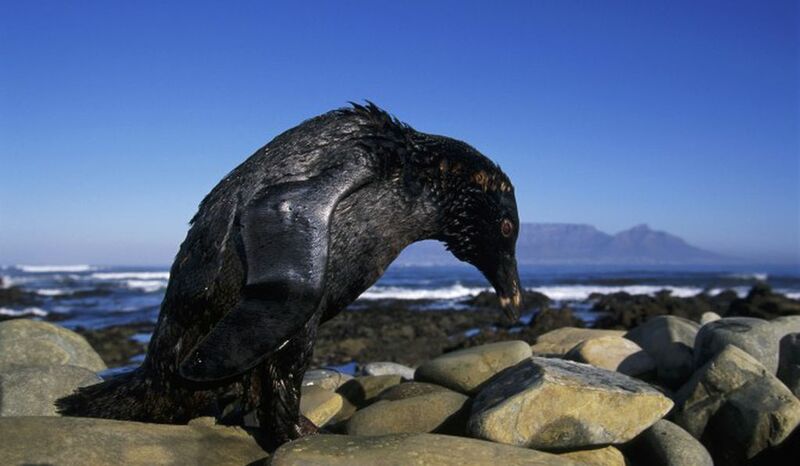 A 1998 oil spill of more than 100,000 liters in the North Sea had killed 13,000 birds inWattenmeer national park, and the scientist had learned that cleaning oil-soaked birds could be as harmful to their immune systems as the oil accumulating in their livers and kidneys. Kill, don’t clean, she advised responders in the 2010 BP spill. Gaus then referred to scientific studies to support her unsettling declaration. One 1996 California study, for example, followed the fate of brown pelicans fouled by oil. Researchers marked the birds after they had been “cleaned” and released them into the wild. The majority died or failed to mate again. The researchers concluded that cleaning brown pelicans couldn’t restore them to good breeding health or “normal survivability.” Another study from 1997 observed that once birds affected by an oil spill had been cleaned, they fared poorly and suffered higher than expected mortality rates. And, consider the 2002 sinking of the MV Prestige. The tanker split in half off the coast of Spain, spilling more than 70 million liters of highly toxic bunker fuel that coated more than 600 beaches with oil. The catastrophe killed some 300,000 seabirds. Although response teams diligently cleaned thousands of animals, most of the birds died within a week. Only a few hundred ever made it back to the wild. In fact, said Gaus, studies indicate that, in general, the post-treatment survival rate of oil-soaked birds is less than one percent. Not all bird cleaning is futile. Rescuers saved thousands of penguins following the MV Treasure spill off South Africa in 2000, for example. Success stories, however, are rare. In the Gulf of Mexico, the giant BP spill probably killed nearly a million birds. Gaus’s comments highlighted two uncomfortable realities: cleaning oily birds is a risky business, and the marine oil spill cleanup can often do more harm than good. 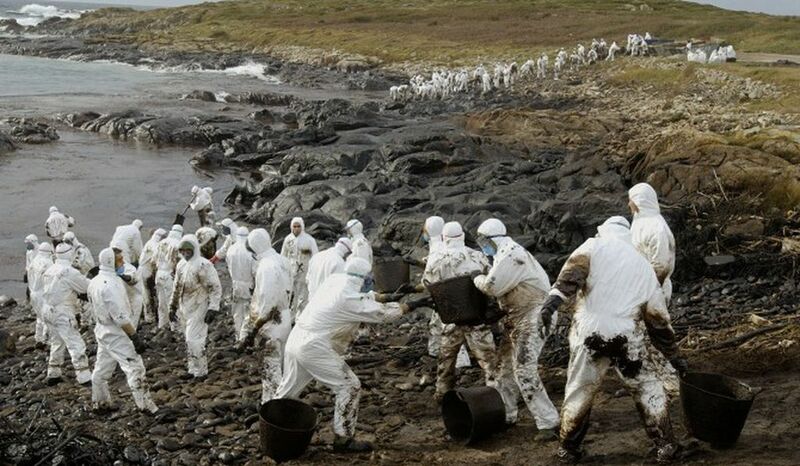 The hard scientific reality is this: a big spill is almost impossible to contain because it is physically impossible to mobilize the labor needed and current cleanup technologies in a timely fashion. When the city of Vancouver released a study in 2015 on the effectiveness of responses to large tanker or pipeline spills along the southern coast of British Columbia, the conclusion was blunt: “collecting and removing oil from the sea surface is a challenging, time-sensitive, and often ineffective process,” even in calm water. Scientists have recognized this reality for a long time. During the 1970s when the oil industry was poised to invade the Beaufort Sea, the Canadian government employed more than 100 researchers to gauge the impacts of an oil spill on Arctic ice. The researchers doused sea ducks and ring seals with oil and set pools of oil on fire under a variety of ice conditions. They also created sizable oil spills (one was almost 60,000 liters, a medium-sized spill) in the Beaufort Sea and tried to contain them with booms and skimmers. They prodded polar bears into a man-made oil slick only to discover that bears, like birds, will lick oil off their matted fur and later die of kidney failure. In the end, the Beaufort Sea Project concluded that “oil spill countermeasures, techniques, and equipment” would have “limited effectiveness” on ice-covered waters. The reports, however, failed to stop Arctic drilling. Part of the illusion has been created by ineffective technologies adopted and billed by industry as “world class.” Ever since the 1970s, the oil and gas industry has trotted out four basic ways to deal with ocean spills: booms to contain the oil; skimmers to remove the oil; fire to burn the oil; and chemical dispersants, such as Corexit, to break the oil into smaller pieces. For small spills these technologies can sometimes make a difference, but only in sheltered waters. None has ever been effective in containing large spills. The issue partly boils down to scale, explains Jeffrey Short, a retired National Oceanic and Atmospheric Administration research chemist who studied the aftermath of the 2010 BP disaster as well as the Exxon Valdez spill in Prince William Sound, which grew at the alarming rate of half a football field per second over two days. “Go try and control something like that,” says Short. Yet almost 30 years after the Exxon Valdez contaminated much of Prince William Sound, the cleanup technology has changed little. Consider, for a moment, the industry’s dismal record on oil recovery. Average citizens may think that a successful marine oil spill cleanup actually involves recovering what has been spilled. They may also expect the amount of oil recovered would increase over time as industry learns and adopts better technologies. But there has been little improvement since the 1960s. During the BP disaster, the majority of the oil evaporated, dropped to the ocean bottom, smothered beaches, dissolved, or remained on or just below the water’s surface as sheen or tar balls. Some oil-chewing bacteria offered assistance by biodegrading the oil after it had been dispersed. Rough estimates indicate that, out of the total amount of oil it spilled, BP recovered 3 percent through skimming, 17 percent from siphoning at the wellhead, and 5 percent from burning. Even so, that’s not much better than the Exxon Valdez spill in 1989 when industry recovered an estimated 14 percent of the oil. Transport Canada admits that it expects only 10 to 15 percent of a marine oil spill to ever be recovered from open water. “Even informed people are taken aback by these numbers,” says Short. Nor are the numbers any better for small marine spills (smaller than 7,950 liters). This year, York University researchers discovered that offshore oil and gas platforms reported a total of 381 small spills between 1997 and 2010. Only 11 spills mentioned the presence of seabirds, yet it only takes a dime-sized blotch of oil in cold water to kill a bird. Self-reporting combined with an appalling spill-recovery record underscores how poorly industry’s preferred technologies perform in the field. Deploying dispersants, for example, is about as effective as cleaning oil-soaked birds and remains another example of response theater designed to hide the real damage. During BP’s catastrophic spill in the Gulf of Mexico, the company sprayed over 6.8 million liters of Corexit. It was the largest volume of dispersant ever used for an oil spill and one giant chemical experiment. Researchers have known for decades that mixing oil with Corexit rarely works. Short compares it to adding detergent when you’re washing dishes: it produces a cloudy suspension that scatters through the water but hovers close to the top. Sweden has banned its use, and the UK followed suit, based on the potential danger to workers. 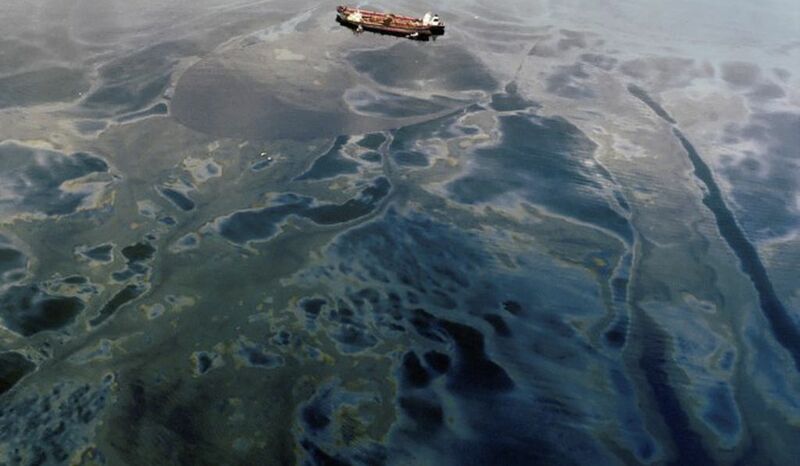 That didn’t stop the aerial bombing of Gulf of Mexico waters with Corexit—which actually killed oil-eating bacteria—because it looked as if the authorities were doing something. Their work made little difference. Bottlenose dolphins, already vulnerable, died in record numbers from adrenal and lung diseases linked to oil exposure. “We’ve put the wrong people in charge of the job,” says McMahon, who has charted industry’s oil spill myths for years. Corexit, industry’s favorite dispersant, is widely believed to contain hydrocarbon, which gives it an ominous undertone. The product was first developed by Standard Oil, and its ingredient list remains a trade secret. Although the oil industry boasts a “safety culture,” everyone really knows that it operates with a greed culture, adds McMahon. Over the years, industry has become adept at selling an illusion by telling regulators and stakeholders whatever they want to hear about oil spills (in the past, executives claimed that their companies recovered 95 percent of spilled oil). In Canada, multinational oil companies also own the corporations licensed to respond to catastrophic spills. The Western Canadian Marine Response Corporation, for example, is owned by Kinder Morgan, Imperial Oil, Shell, Chevron, and Suncor while the Eastern Canada Response Corporation is owned by Ultramar, Shell, Imperial Oil, and Suncor. In a recent analysis on this cozy relationship, Robyn Allan, an economist and former CEO of the Insurance Corporation of British Columbia, concluded that letting international oil companies determine the goals and objectives of marine spill preparedness and response was a flagrant conflict of interest. Based on the science, expecting to adequately remedy large spills with current technologies seems like wishful thinking. And there will be no change unless responsible authorities do three things: give communities most affected by a catastrophic spill the democratic right to say no to high-risk projects, such as tankers or pipelines; publicly recognize that responding to a large oil spill is as haphazard as responding to a large earthquake and that there is no real techno-fix; and recognize that industry won’t adopt more effective technologies that actually recover oil from the ocean until governments and communities properly price the risk of catastrophic spills and demand upfront multi-billion-dollar bonds for compensation. “If they spill, they must lose a bloody fortune,” says Short. Until those reforms take place, expect more dramatic prime-time theater on oiled ocean waters. But we shouldn’t for a moment believe we’re watching a cleanup. The only things being wiped clean are guilty consciences.